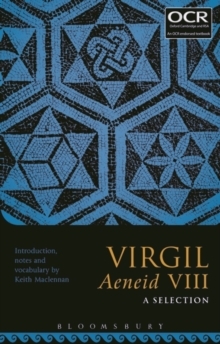 This is the endorsed publication from OCR and Bloomsbury for the Latin AS and A-level (Group 3) prescription of Virgil's Aeneid VIII, giving full Latin text, commentary and vocabulary for lines 86-279 and 558-584, along with a detailed introduction. Book VIII of the Aeneid is remarkable for the diversity of its subject matter. Aeneas travels upriver to the site where Rome will be founded. He meets King Evander, who tells him the dramatic story of Hercules and Cacus and shows him round 'Rome' before it is Rome. Aeneas' mother makes new armour for him and at the end of the book we see him brandishing the shield whose centrepiece is the triumph of Augustus. The OCR selection focuses on Evander and Hercules, and concludes with the fatal moment when Aeneas takes Evander's son Pallas to war. Its vivid narrative, human characters and larger-than-life heroes and villains are compelling reading.